When an oocyst of Cyclospora cayetanensis enters the small intestine, it invades the mucosa, where it incubates for about one week. After incubation, the infected person begins to experience severe watery diarrhea, bloating, fever, stomach cramps, and muscle aches. 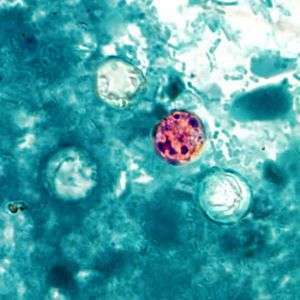 Oocysts are often present in the environment as a result of using contaminated water or human feces as fertilizer. Cyclosporiasis primarily affects humans and primates. Diagnosis can be difficult due to the lack of recognizable oocysts in the feces. PCR-based DNA tests and acid-fast staining can help with identification. The infection is often treated with trimethaprine-sulfamethaxozol [Bactrim, co-trimoxazole], because traditional anti-protozoal drugs are not sufficient. To prevent transmission, food should be cooked thoroughly and drinking water from streams should be avoided while outdoors. There is no vaccine to control Cyclospora infection in humans at present, but one is available for reduction of fetal losses in sheep. Although it was initially thought that Cyclospora was confined to tropical and subtropical regions of the world, occurrences of Cyclosporiasis are becoming more frequent in North America. According to the Centers for Disease Control and Prevention, a U.S. government public health agency, there have been 11 documented Cyclospora outbreaks in the U.S. and Canada since the 1990s. The CDC also recorded 1,110 laboratory-confirmed sporadic instances of Cyclosporiasis. Between June and August 2013, multiple independent outbreaks of the disease in the U.S. sickened at least 631 people across 25 states. Investigations later identified a bagged salad mixture as the cause of the outbreak in Iowa and Nebraska. In 2015, the CDC was notified of 546 ill persons with confirmed Cyclospora infection across 31 states. Cluster investigations in Texas, where the greatest number of infections was reported, suspected contaminated cilantro as the culprit. ↑ Talaro, Kathleen P., and Arthur Talaro. Foundations in Microbiology: Basic Principles. Dubuque, Iowa: McGraw-Hill, 2002. ↑ "Surveillance for Laboratory-Confirmed Sporadic Cases of Cyclosporiasis --- United States, 1997--2008". cdc.gov. ↑ "Case Count Maps - Outbreak Investigations 2013 - Cyclosporiasis - CDC". cdc.gov. ↑ "CDC: 425 cases of cyclospora infection identified across 16 states". cbsnews.com. 5 August 2013. ↑ http://www.idph.state.ia.us/IDPHChannelsService/file.ashx?file=2721EA4A-DB6B-4746-9FF4-0BF09C9BF3BE Iowa Cyclospora Outbreak 2013 /Outbreak Update 7.31.13, Iowa State Department of Public Health. Downloaded 6 Aug 2013.